3587 former tobacco smokers surveyed by internet report a median duration of e-cigarette use of 3 months. E-cigarettes were used much as people would use NRT: by former smokers to avoid relapse, or as an aid to cut down or quit smoking. Further research should evaluate the safety and efficacy of e-cigarettes … for quitting and relapse prevention. 25 July 2009 Row breaks out over safety of e-cigarettes. Cigarette butts and other tobacco products are a hazard to children- over 13,000 US child poisonings in 3 years1. Propylene glycol-nicotine liquid is easier to swallow or absorb via skin. Avoid bottled nicotine. Liquid nicotine (e-liquid) is commonly sold in small bottles of up to 30 mL or more, on the internet, or from stores in the USA, often meant to last consumers one month; often unlabelled as to nicotine dose. Health New Zealand Ltd does not recommend sale or use of e-liquid permitting a lethal dose of nicotine to be swallowed. * Nicotine solution sold in child-proofed cartridges avoids this risk. Lethal dose for a child is 10mg nicotine. Many bottles on sale contain many times this amount. Even if the cap of a liquid nicotine bottle is child proofed, the risk remains if someone else leaves it open. For adults, absorption of a fatal dose of 40-60 mg of nicotine could rapidly occur due to spilling the liquid on one’s skin while using liquid nicotine to (cheaply) fill an e-cigarette – a risk heightened by inattention (distraction, fatigue, alcohol, drugs). (Wash it off immediately). Gloves should always be worn. Avoid gravity feed. E-cigarettes should not be tipped up above mouth level, as the e-cigarette liquid can ooze out and drain nicotine on to the lips. *The solvents and flavours of the liquid in the wick can mask the bitter taste of nicotine, so when a child tastes it, the liquid is not immediately spat out, but absorbed from the mouth, with risk of nicotine overdose. will hopefully keep the e-cigarettes on sale (as in the UK), while further research can be conducted and suitable approvals applied for. Simply banning e-cigarettes will simply consign thousands of e-smokers back to smoking tobacco and an early death. That would be crazy. The mist of the e-cigarette has been rigorously tested. Of over 50 priority-listed cigarette smoke toxicants tested, none was detectable in the mist of the Ruyan® e-cigarette, except for a trace of mercury close to the limit of detection. Some toxicants remain to be tested before the results are submitted for publication shortly in a peer-reviewed journal. On the basis of findings to date, inhaling mist from the e-cigarette is rated several orders of magnitude (100 to 1000 times) less dangerous than smoking tobacco cigarettes. The nicotine dose per puff is comparable to that of a medicinal nicotine inhaler. E-cigarette nicotine is apparently not absorbed from the lung, but from the upper airways. 2) E-cigarette efficacy. Poster 5-50, Effect of an E-cigarette on Cravings and Withdrawal, Acceptability and Nicotine Delivery: Randomised Cross-over Trial. On behalf of Ruyan, manufacturer of the Ruyan V8 e-cigarette, Health New Zealand Ltd sponsored this research carried out in Auckland by researchers at the School of Population Health, University of Auckland. See http://www.healthnz.co.nz/ecig_effect-2.pdf The study has been submitted for publication in a peer-reviewed journal. This nicotine inhaler mimics the smoking experience more closely than any smokeless product to date and provides nicotine without causing smokers to cough. It looks and acts like a cigarette. 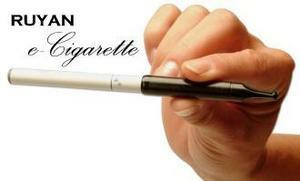 It gives the pleasure of drawback, and maximum nicotine effect is reached within 20 minutes. It is likely to be popular as a much cleaner and safer alternative to smoking, by eliminating the tar and the toxicant gases. More frequent puffs are desirable, as the nicotine dose is less than from a tobacco cigarette, and holding it in the lung for longer before breathing out may increase satisfaction. Deeper puffs, however, may not increase satisfaction. Description The Ruyan® e-cigarette is a battery-operated nicotine delivery device, without the carcinogens and toxicants. The white segment contains a re-chargeable battery (charged overnight from the mains), the dark coloured body contains a vapourising chamber. Near the mouthpiece a replaceable wisp of plastic foam is soaked in a nicotine-containing solvent (propylene glycol). The company wants to market it as a cigarette substitute, for the smoker who wants to continue to enjoy the act of smoking, but without the risks. Most countries, however, only provide for the sale of nicotine as a medicine, to aid quitting. Cost is less costly than smoking in countries with high cigarette taxes. The rechargeable battery lasts for 1300 puffs. Mechanism. Inhalation at the mouthpiece activates the electric circuit, sparking vapourisation of nicotine in a mist of propylene glycol, an FDA approved solvent. A few percent of the solvent weight in some brands is tobacco essence. The white vapour mist exhaled is not smoke, so it can be “smoked” indoors. An artificial red light glow at the tip is generated by the drawback. - Health New Zealand Ltd.
Dosimetry. It is available in pipe and cigar forms. The nicotine in the cartridge comes in four strengths, of 16 mg, 11 mg, 6 mg and 0 mg nicotine content. Ten e-puffs equal one tobacco puff for nicotine for the Ruyan brand, but this is approximate only. Biological effect. Five minutes smoking gives maximum effect within 20 minutes. The battery and cartridge must be fresh. New Zealand The only pleasurable drug so far permitted to be sold without regulation is coffee. Current legislation does not encompass the concept of pleasurable, largely harmless nicotine. Nicotine has wrongly acquired a reputation as dangerous, by long association with its serial-killer half-brother Cigarette Smoke, and so nicotine is regarded as a drug to be avoided and abstained from, although it is true that once embraced it is difficult to escape from. Nicotine patches and gum are aids to total and permanent nicotine abstinence. However relapse to take up smoking and cigarette nicotine is common. Ministry of Health (Medsafe) ruled (August 2007) that the Ruyan® e-cigarette comes under the requirements of the Medicines Act, and cannot be sold except as a registered medicine, and as such could be advertised. If sold as a tobacco product, under the Smokefree Environments Act (decision awaited), then it could not be advertised. Non smokers. Nicotine-naïve non-smokers using the 16 mg version may possibly experience the same effects as first-time smokers. They may cough and gag at the throat. Inhaling into the lungs can cause nausea, dizziness and vomiting. Non-smokers should use only the 0 mg strength. Pregnancy As this device can deliver nicotine, it is contra-indicated in pregnancy, unless the woman has not been able to quit smoking by other means. Cardiovascular disease. Nicotine increases the work of the heart and in high dose may trigger heart beat irregularities. Children or adults. The Ruyan V8 e-cigarette is difficult to unscrew at the mouthpiece-end. Children would be at risk of nicotine poisoning if they put the unscrewed cartridge in their mouth, just as if they swallowed cigarettes or tobacco, or any nicotine product.